Akkadian specialist and expert in Near Eastern religious traditions Dr Matthew Neujahr gives us the rundown of what we can say – and what we can’t – about the influence of earlier Near-Eastern traditions and texts on the apocalypses which begin to appear in Second Temple Judaism from the third century BCE. There was an explosion of interest in cuneiform texts vis à vis the Bible as soon as it became clear in the nineteenth century that some motifs – such as the story of the universal flood sent by God to clean up the world – were not solely to be found in the Hebrew writings. But the enterprise of finding ‘origins’ for every Biblical motif and story in Near-Eastern sources is full of tempting pitfalls. In this episode we attempt to get a handle on the state of research, on what we can’t say with any certainty, and, best of all, a few points which we can, with some confidence, locate in a Near-Eastern milieu. Most strikingly, large-scale transfer of early scientific knowledge, including astronomical, calendrical, geographical, and metrological information, found its way into early Hebrew apocalypses, such that we must posit some contact between the apocalypse writers and the scribal culture of Mesopotamia. Dr Matthew Neujahr has a PhD in Hebrew Bible from Yale University. His research focuses on apocalyptic literature, Second Temple Judaism, the Dead Sea Scrolls, Late Babylonian literature & religion, and cross-cultural knowledge transfer in the Near East in the latter half of the first millennium BCE. You can find a selection of his publications here. Adapa: Shlomo Izre’el. Adapa and the South Wind: Language has the Power of Life and Death. Mesopotamian Civilizations. Winona Lake, IN: Eisenbrauns, 2001. Critical edition with English translation. Aramaic Levi Document: Drawnel, H., 2004. 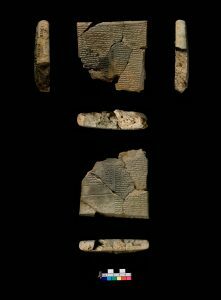 An Aramaic Wisdom Text From Qumran: A New Interpretation of the Levi Document. Brill, Leiden. Critical edition with English translation. Bahman Yasht: See Collins, J. J., 1979. ‘Persian Apocalypses’ in J. J. Collins, ed. Semeia 14, pp. 207-14. The Bahman Yasht is discussed here under the alternate name/romanization Zand-î Vohuman Yasn. Lebowski, The Big: The Big Lebowski, Joel and Ethan Coen, 1998. Neujahr, M., 2012. Predicting the Past in the Ancient Near East. Brown University, Providence, RI. Sanders, S. L., 2017. From Adapa to Enoch: Scribal Culture and Religious Vision in Judea and Babylonia. Mohr Siebeck, Tübingen. Testament of the 12 Patriarchs: for English, Charlesworth, J. H., 1983. The Old Testament Pseudepigrapha. Doubleday, Garden City, NY, and London, vol. 1. Glessmer, U. (1996). ‘Horizontal Measuring in the Babylonian Astronomical Compendium MUL.APIN and in the Astronomical Book of 1En’, Henoch 18 : 259-282. Kvanvig, H. S., 1988. Roots of Apocalyptic: The Mesopotamian Background of the Enoch Figure and of the Son of Man. Neukirchener Verlag, Neukirchen-Vluyn, Germany. Neugebauer, O., 1981. The “Astronomical” Chapters of the Ethiopic Book of Enoch (72–82). Munksgaard, Copenhagen. Neujahr, M. ‘Babylonian Scribalism and the Production of Apocalypses and Related Early Jewish Texts,’ HeBAI 3 (2016): 212-232. Sanders, Seth L. ‘The First Tour of Hell: From Neo-Assyrian Propaganda to Early Jewish Revelation,’ JANER 11 (2009): 151–169. VanderKam, J. C., 1984. Enoch and the Growth of an Apocalyptic Tradition. Catholic Biblical Association of America, Washington, DC.